Noir Syndrome is a randomly generated murder mystery game in which you, a snappily dressed freelance gumshoe, have two weeks in which to identify and arrest a mysterious and unidentified serial killer. 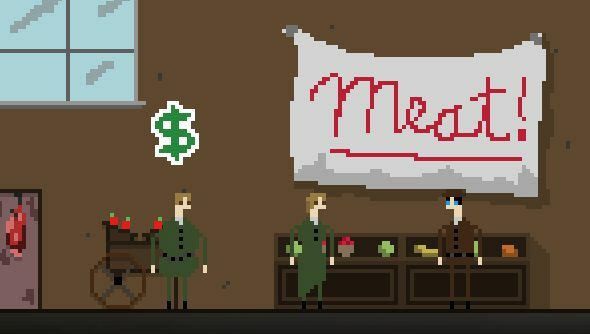 The game is set in a smokey, 2D pixel-art world with a lovely jazzy brass soundtrack, in a city populated by a finite cast of police, mobsters and regular Joel Schmoels, each of whom can be found strolling around somewhere, as brazenly persistent as you like. Each time you play, the murderer changes identity, the clues point in different directions and the crime retangles itself, ready to be solved all over again. It launched earlier this year for £4.99, but it recently received a content update that pushed it back into my Steam library. So here are some thoughts on it. Noir Syndrome is perhaps a little more basic than you’re imagining. You never actively investigate any crime scenes, you never stand over a chalk outline or follow a string of clues to a logical conclusion. Instead the game plays out like a game of cards, in which you’re eliminating possible leads until you’re left with the only possible answer. At the beginning of each day you may choose to visit one of a few dozen locations around the city: places such as the department store, city hall, the local diner or the old watchtower. Once on the scene, it’s your job to press Z on all of the items of furniture to poke about the place, uncovering clues as you go. These clues are entered into your notebook and are all, handily enough, 100% relevant to the serial killer. A business card, for example, allows you to narrow down the list of available suspects to a person whose role iseither ‘civilian’ or ‘mobster’. Leather gloves can only belong to a suspect whose hobby is ‘chef’ or ‘driver’. A set of male fingerprints will rule out all women from the investigation. By collecting these clues you can rapidly hone in on the culprit who shares every single one of these traits, though you always choose to risk arresting the wrong person if you want to attempt to quickly solve the case for extra points. You’re not handed a roster of suspects to narrow down however. Instead you build up a list of names by talking to the folks you find milling about the different areas of the city, most of whom will readily accuse another named character as the murderer. Once you’ve gathered enough information to be certain of who the culprit is, you can name them, at which point their location in the city will be flagged and you can totter of to arrest them. It’s a bit like Guess Who? crossed with Cluedo, and while the basic system is a little too rudimentary to consider itself “procedurally generated” (each case is, ultimately, the same but with the names and hobbies changes around), it is compelling enough that you’ll want to at least solve a few cases successfully. A few other systems come into play to make things more interesting. Every time you investigate or talk to somebody, you become increasingly hungry, like a peckish, canapé fuelled Angela Lansbury. 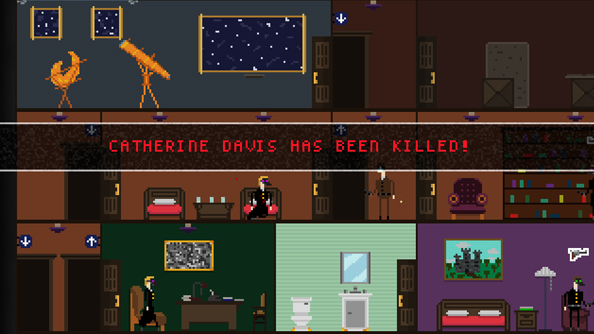 Not starving to death is, weirdly, one of Noir Syndrome’s bigger challenges, especially on higher-than-normal difficulty settings. You can find food at diners and markets and some other locations in the city, but purchasing this food requires money. The same is true of lockpicks, which are used to pick locks, and bullets, which you’ll need to defend yourself in the event that the serial killer (or the mob) sends a hitman after you. It’s possible to fall foul of either the police, the mob, or both. The former will shoot on sight if you’ve commited any crimes in front of witnesses. The latter will send hitmen (a recently added feature) if you’re caught stealing from their vaults or attacking their friends. Each day there’s a random chance that a location in the city will become a police zone or a mob gathering, meaning that, depending on their attitudes towards you, you must avoid visiting certain locations on certain days. Similarly, if on a given day a location is marked as a crime scene, it means it will be empty of other characters, allowing you to steal (pretty much, I think) without repercussion. When marked as hosting a public gathering, more regular citizens than usual will be found there, and if declared “fishy” by somebody you speak to, a location will yield more clues than it usually would. These random location-modifiers help you decide where to go on any given day. There are also some special locations I haven’t been able to get inside yet, such as the vault that requires 20 lockpicks to enter. Enough little details like this make the world feel interesting, and the areas of the city are fairly visually distinct. On the last page of your notebook you’ll also find a unique challenge, which changes with each game. Sometimes you’ll be challenged to crack three vaults, other times you’ll have to kill 15 NPCs, or win $50 gambling on dice at the mob den. Coupled with the higher difficulty settings, which start you out starving and unarmed, quadruples the price of meals and sets the mob and the police against you, there’s enough of an interesting challenge to be found once the basic fun of solving the cases beguns to run dry. Achievements and unlockable costumes are there for anybody who gets really into it. 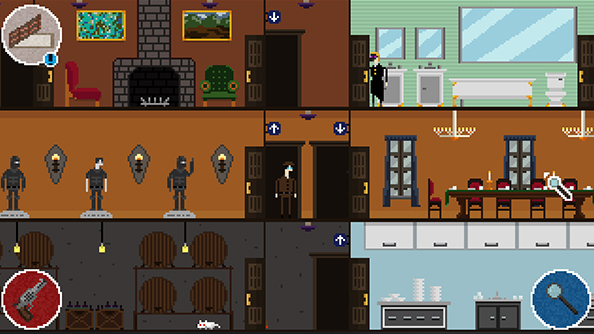 The largest and most recent update also introduces Dinner Party mode, which condenses the entire murder mystery into a single building on a single evening. Here you’re still collecting clues, but you start out with the names, occupations and hobbies of all of the suspects already in your notebook. Cooped up in the murderhouse, the unhinged dinner guests are prone to brief fits of madness, during which they’ll happily fire a gun at you. With bullets being a one-hit kill affair, it requires quick thinking to dodge their unprovoked attacks, or to defend yourself by firing off a shot of your own. Noir Syndrome’s basic murder-solving gameplay loop is rudimentary enough to keep your interest, at least until you’ve stopped missing the £4.99 you spent on it. The music is lovely enough that you’ll chase at least a few dozen serial killers just to keep it ticking over. It’s also possible, in either mode, to shoot and kill the serial killer without realising it, thereby creating an unwinnable case. Which is a bit brilliant.